FinIQ was formed in 2001 with its headquarters in Singapore. Today, we have offices spread across Hong Kong, UK, Malaysia, India, Taiwan and Thailand. We are a privately-held, consistently profitable, organically-grown and debt-free firm. We have a team of about 350 professionals, working on implementation, R&D, support and development. We have the right mix of employees with about 50% of our workforce being developers and the rest comprising of quants, business analysts and testers. Our employees are top brains hired from the best universities and our core team has highly experienced people from the IT and banking industry. We invest heavily in fundamental research. We use our own financial product design framework and have our own in-house payoff language, editor, self-designed documentation engine, pricing mathematics, generic Monte Carlo, what-if tools and workflow management tools, amongst other things. We maintain very strong quality management processes. For our products, we have a regression test lab set up followed by a very formal release procedure and incident logging platform. 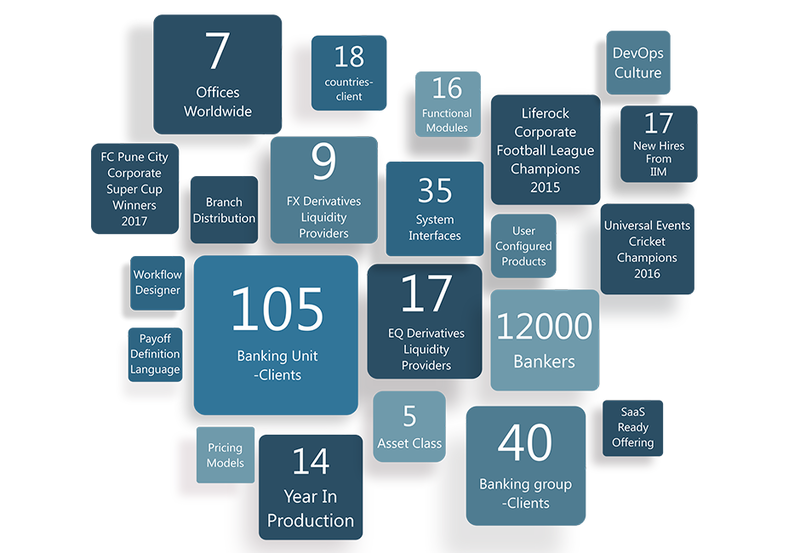 And because of all these systems and processes, we have been able to successfully serve more than 40 banking groups and more than 105 banking units spread across 18 countries. We are a 100% product-based firm and are the sole owners of our software and intellectual property, without the involvement of any third-party. We support a diverse range of products and functions, covering almost all asset classes and front-office, middle-office and back-office systems.